I cannot believe that we’re already a week into December, so to kick start our Christmas baking inspiration I thought I’d share a vegan & gluten-free chocolate orange recipes for a free-from Xmas fest! One of our young neighbours (Jasper, now aged 9) LOVES the classic Christmas chocolate orange combo, so I started making ‘safe’ vegan & gluten-free chocolate orange treats for our annual neighbourly gathering. There are certain flavours I associate with Christmas and chocolate orange is up there. Over the years I have created quite a few different recipes to cater for Jasper – generally I make at least one tray of chocolate orange treats for the afternoon/evening we gather a long with a load of other scrummy treats to cater for everyone else. You can pop over to CHRISTMAS in our recipe index, under occasions to check them out. I will be adding more recipes over the coming couple of weeks. A Christmas tradition for me is having Chrish, my fellow baker and foodie (and my geology field partner from uni days), come over for a day of vegan & gluten-free baking. She dropped by today for coffee and cake, so we could discuss what we’re gonna bake together next week (sneak peek – we also prepped our pepparkalor mix today as it’s best if it has sat in the fridge for at least a week.) So today my Christmas baking has finally started to get into gear! And I am so excited!! I love feeding people and surprising them with tasty food that they cannot believe is free-from allergens. Christmas is a great excuse to ply loved ones, family, neighbours, guests and visitors with scrummy treats and lovely seasonally spiced drinks. We love spices in our home! These Christmassy ones top our : cinnamon, ginger, cloves, nutmeg, cardamon – any time of the year but Christmas is a great excuse to add it to everything ;P I’m looking forward to sharing some of our favourite spicy Xmas treats with you over the coming days. But back to the classic chocolate orange combo. The vegan & gluten-free chocolate orange kisses below are a fantastic Xmas treat. We bake the chocolate biscuits and freeze them in labeled ziplock bags. The orange frosting we make and store in a sealed container in the fridge. The biscuits take between 5-15 minutes to defrost – depending on how big you make them and how warm your kitchen is. So if folks drop by, we can whip them out of the freezer, kiss them together with the ready made orange icing and they are ready to eat by the time the coffee has been made! The vegan & gluten-free chocolate orange cookies are also really easy and pretty speedy to make. I tend to make these if I know our friends are coming over for a walk in the cold, crisp Surrey Hills. I time it so that these simple cookies are coming out of the oven and their aroma fills our home as our friends arrive. They are a great incentive for little legs towards the end of the ramble! I’ve added the vegan & gluten-free chocolate orange meringues as vegan meringues should be shared at every opportunity! Vegan baking knows no bounds which I find very exciting. I have also added a classical and simple vegan & gluten-free chocolate orange cake, and vegan frostings in both chocolate and orange flavours just so you have everything in one place. I hope that something below inspires you to give vegan & gluten-free chocolate orange baking a go. And if you have any cool relevant recipes you’d like to share please do. We’d love to hear from you and try out your allergen-free baking recommendations. These vegan & gluten-free chocolate orange-blossom kisses are a fresh and yummy combo. The orange-blossom icing is light and summery, bringing some freshness to the rich chocolatey melt-in-your-mouth chocolate biscuits. Pre-heat the oven to 170ºC and prep a baking tray with baking paper. In a bowl beat the spread &sugar thoroughly. When it's nicely creamed add the flour & raw cacao powder* and mix well. looks sticky but rolls into little balls nicely! Even though the mix seems wet & cloying it rolls into little balls surprisingly well. Place your little rolled balls of dough on waiting baking tray, then flatten them with two fingers. Pop into the oven for 15 minutes. Place on a colling rack once cooked and ensure they are cold before making into chocolate orange kisses (otherwise residue heat will melt the icing!). To make the orange blossom b*tter cre*m beat the sugar into the spread then add the orange blossom extract. When the biscuits are cold you can put a dot of icing on one and then squidge another biscuit on top. Job done! The biscuits (with no icing) freeze brilliantly and take less than an hour to defrost so I tend to make a mass of them and pop them in the freezer in a sealed bag, ready to whip out if people drop by. I keep the icing in an airtight container in the fridge so the biscuits can be transformed into kisses at a moments notice. B*TTER CRE*M icing is butter-free, better-cre*m icing, it's 100% vegan and I use the *s to avoid confusion - as there is no butter or cream in our recipe. Preheat the oven to 150°C (fan oven) and prep a large baking tray with baking paper. Beat the sunflower spread and sugar together until creamed. Add the flour and salt to the mix and combine, add the orange blossom extract as it starts to turn into a dough. Don't over-beat the mix. Stir in your chocolate chunks* as many or as few as you fancy! Dollop spoonfuls of the mix onto your waiting baking tray - you can see the size we make ours in the photo. *as it is often hard to find chocolate chips free-from dairy and soya so we chop up safe dark chocolate into chunks to go in these scrummy cookies. **If you prefer crunchy biscuits bake these for 20 minutes, if you prefer them softer go for 15 minutes. We like ours between the two and bake them for 17 minutes to get our crunchy/chewy perfection balance! Likewise if you choose to make mahooosive cookies they will need to bake for longer than 17 minutes. We love a good chocolate orange flavour combination, and this chocolate orange cake ticks all the boxes for us. Preheat your oven to 180°C (fan) and prep 2 cake tins (you can grease and then dust flour over them or use baking paper. In a large bowl combine the oats, self-raising flour, sugar, bicarbonate of soda and salt. Once the ingredients in your pan are melted and combined, stir in the marshmallows, and cider vinegar. When the marshmallows start to melt into the mixture add the dry ingredients from your bowl and remove the pan from the heat. Continue to stir until everything is combined and then add in the orange blossom extract - mix them in well. 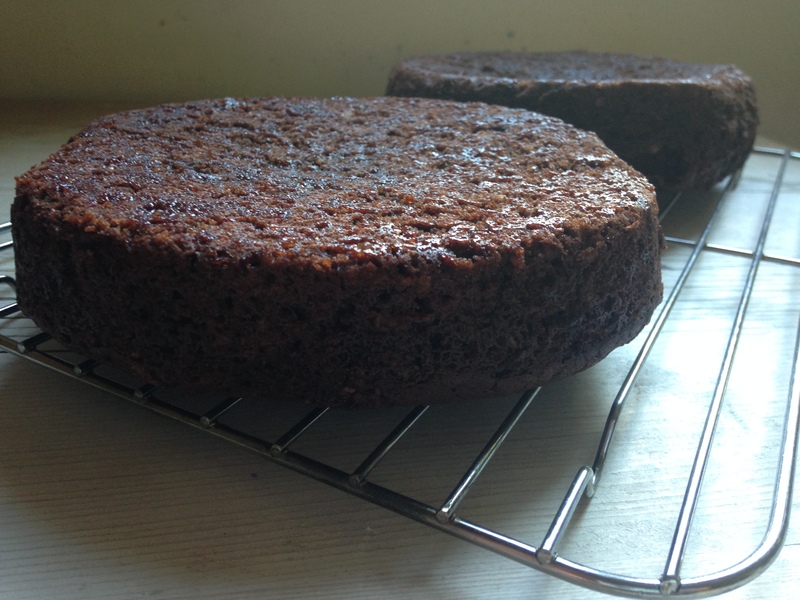 When your cakes come out of the oven let them sit for five minutes in their tin before turning them out onto a cooling rack. Make sure that they are 100% cooled before icing them. **if you don't have mini marshmallows chop up some big ones! The cake pictured has been iced with a new recipe I've been developing made with coconut yogh*rt! It's not been tried and tested enough to go on the blog but if you are after a good vegan icing try this chocolate one or this orange one! I also popped on some orange vegan meringues as they got so well together! Yes! These little delights are egg-free and lovely and light with that perfect meringues texture my granny used to make. They are great on their own or kissed together with some dark chocolate icing! Preheat your oven to 120°C, and prep a baking tray with baking paper. Measure out ¼ C* of your chickpea water to go into a mixing bowl. Whisk in the sugar this should help stiffen up your light and frothy mix. Whisk until it forms lovely peaks. Quickly whisk in the orange blossom extract and cream of tartar. As soon as they have blended in stop whisking. 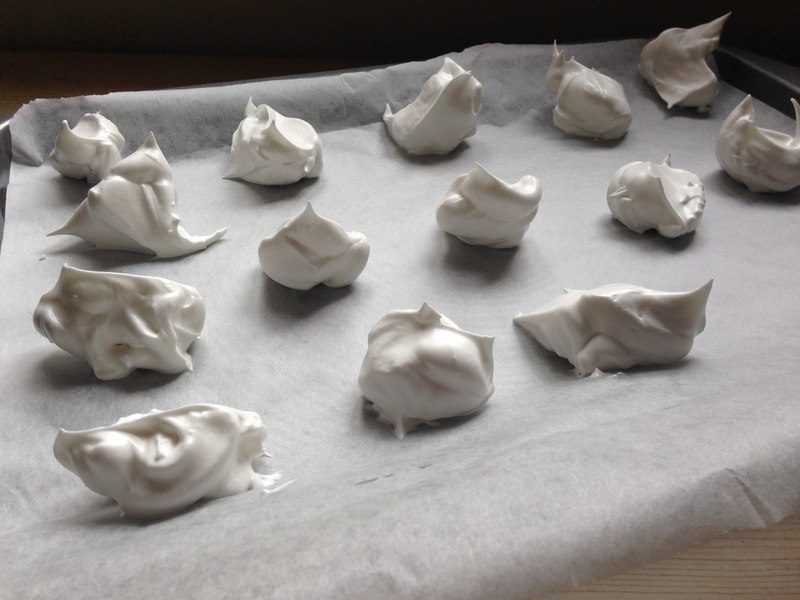 Spoon out blobs of your delightful meringue mix onto your waiting baking tray. Pop into the oven for 90 minutes. It is REALLY important that you DO NOT open the oven door during the baking process. Once the 90 minutes is over, turn off the oven but DON'T open the door - leave your meringues in there to cool down with the oven. Once the oven is cold you can open the door finally and enjoy your wonderful egg-free meringues. * I let the chickpea water settle for a while and then pour off the top thinner liquid and use the thicker heavier juice at the bottom of the jug for my egg-free meringues - I don't know if it makes a difference but it is my habit as I know they work perfectly this way. This orange vegan frosting is really easy to make and great a-top vanilla cupcakes and chocolate cupcakes. The citrus flavour is refreshing and light. 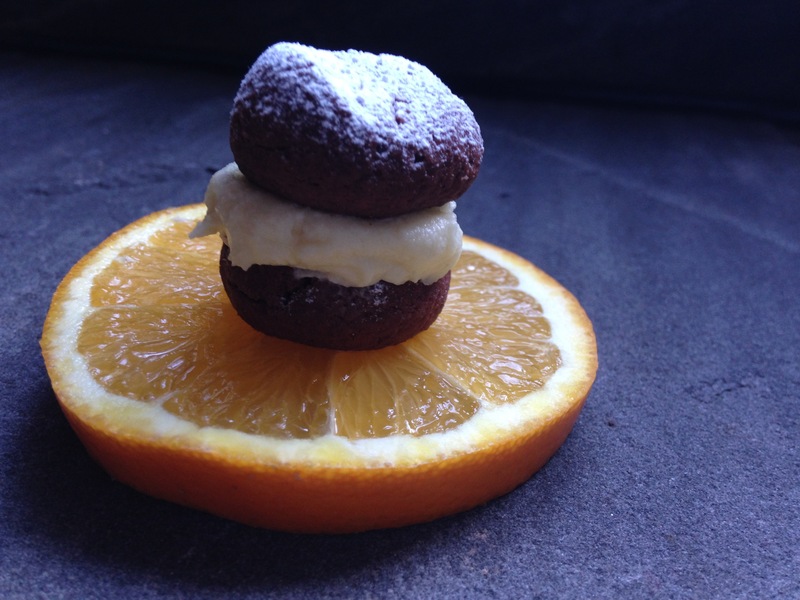 Let us know what your fave flavour combination is with this vegan orange frosting. When I ice cupcakes for an event, I tend to do tiny little dots of icing on half the cakes and then full-on smothering (as pictured here) for the other half. It gives people the option of how much sugar they want to eat with their cupcake! Cream the fats together until they are throughly combined and smooth. Then add the icing sugar, I do this in half cup measures with a lid on the mixer to avoid a sugar storm! Once the icing sugar is beaten in add the orange extract and beat for a couple of minutes and get ready to pipe. Always make sure that your cakes are 100% cold - with no residual heat in their centres before you start decorating them with this fresh and fruity icing! This chocolate vegan frosting is really light and fluffy - you beat the air into it, so I recommend you use a machine to do this tiring job for you. I use my kenwood chef and it's K-beater attachment. That said it is worth the time and effort as it is another lovely vegan frosting. It makes me very happy that our children don't miss out just because they cannot have unhealthy butter cream. I also love that vegan food can still be naughty and nice. You don't have to smother cupcakes in icing to make them look cute and pretty! In a mixer beat the trex & spread until they are well combined and fluffy (about 4 minutess in my kenwood chef with a K beater). Add the icing sugar & raw cacao powder and beat for another 4 minutes. Then add the m!lk alternative & vanilla; beat for about 7 mins until really light and fluffy. Pop the lot into the fridge for at least half an hour to cool before icing your cakes. Always ensure your cakes are cold when you ice them, if they have any internal warmth still they will melt your icing.